Overview. In November, Red River Gorge will be filled with runners taking on a challenging race - the Rough Trail 50K and 25K. My friends, Bork and Red Belly, wanted to checkout the course before signing up, so we hiked it along with my son, Chase, who was visiting from Colorado. 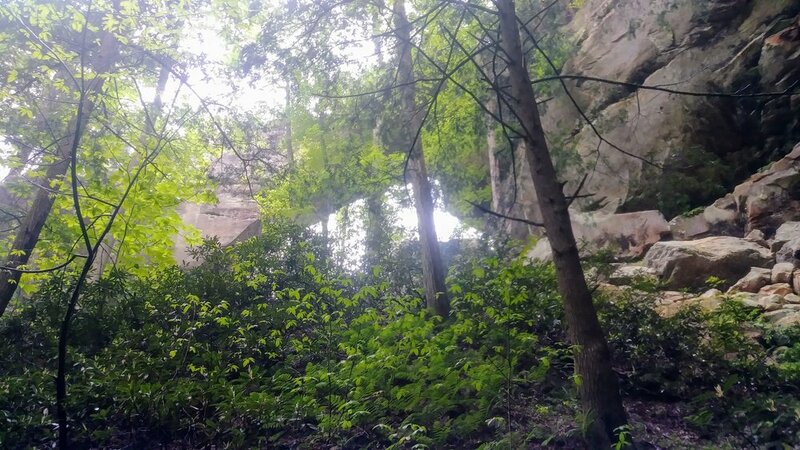 The course includes "The Big Loop" that utilizes a number of trails on the south side of Red River Gorge forming a roughly 11-mile loop. The only difference is the Rough Trail 25K course adds a tough 1.2 mile out and back to Chimney Top Road. 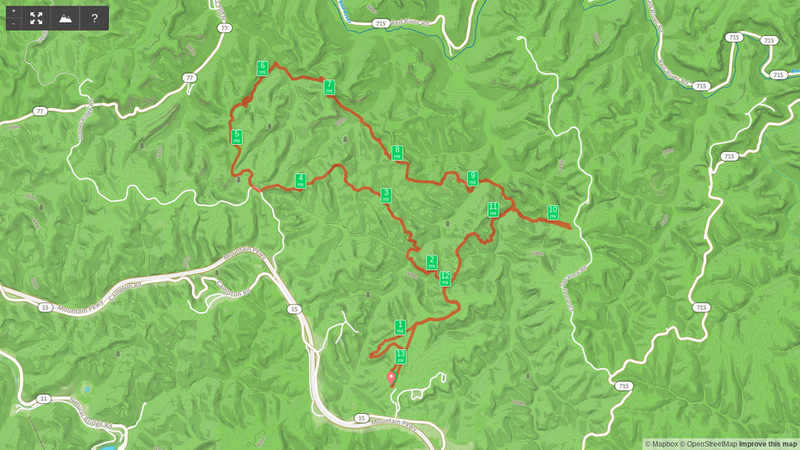 While the course isn't crazy difficult overall, the last three climbs - to Chimney Top Road, to Koomer Ridge, and finally, up from Hidden Arch - are a bit on the sadistic side. They're steep and late - a grueling combination to be sure. Regardless, we managed to hike it in about 7 hours while stopping to enjoy lunch, but we skipped the second visit to Hidden Arch and ran back to our campsite just ahead of a thunderstorm. NOTE: Parking nearest the trailhead is reserved for campers. Day users must park at the trail parking lot near the campground entrance. Trail navigation. From Koomer Ridge Campground, start on Koomer Ridge Trail for one-tenth of a mile and turn left onto Hidden Arch Trail. At mile 1.0, rejoin Koomer Ridge Trail and continue to the intersection with Buck Trail at mile 1.8. Turn left (west) onto Buck Trail and continue until its end at Pinch 'em Tight Trail. Turn left (west) again at mile 3.2 to follow Pinch 'em Tight Trail to Tunnel Ridge Road at mile 4.3. Walk a short while on Tunnel Ridge Road and turn right (north) into the Gray's Arch Picnic Area. Continue north onto Gray's Arch Trail at mile 4.5 and follow it until it splits at mile 5.6. Take a right (south) to walk up to the arch. This is a great place to have lunch or take a break. Once you've finished taking in the sights, retrace your steps and continue north onto Rough Trail and follow it all the way to Chimney Top Road at mile 10.2. Hike back down Rough Trail to the intersection with Koomer Ridge Trail at mile 10.8 and turn left (south) to return the the trailhead. PERFECT TIMING - Rhododendrons. 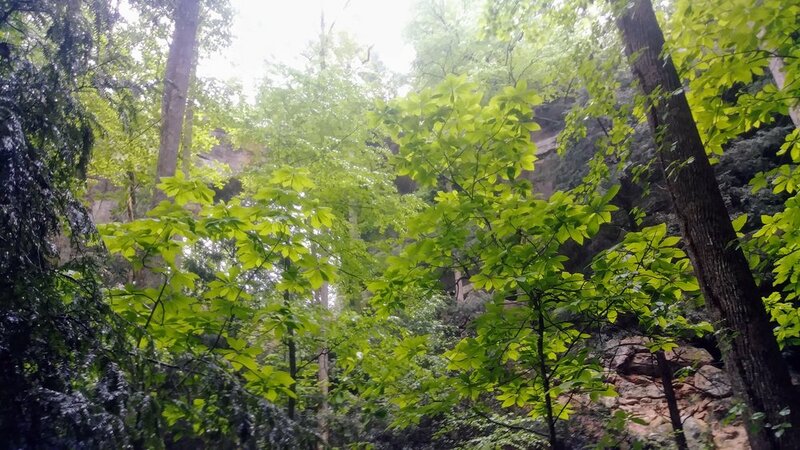 In June, rhododendrons bloom in Red River Gorge, and this particular hike is one of the best to see them - particularly along the climbs/descents.